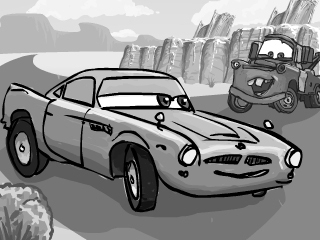 I did quite a few storyboard drawings for Cars 2 on the Explorer. Usually I do these kind of illustrations in pencil, but this time I used Flash for the job. There was a ton of work to do, so keeping the sketches loose and quick was the way to go. That’s Finn McMissile in the foreground (above). He was voiced by Michael Caine -one of my favorite actors. My father said he went to acting school with him in London. I’m not sure if it’s true or not, but it makes a good story. If you like Michael Caine, check out a movie he did in 1981 called The Hand. Caine plays a comic book artist who loses his drawing hand in a freak accident. Then Caine loses his mind and starts murdering people… or is it THE HAND?!?! 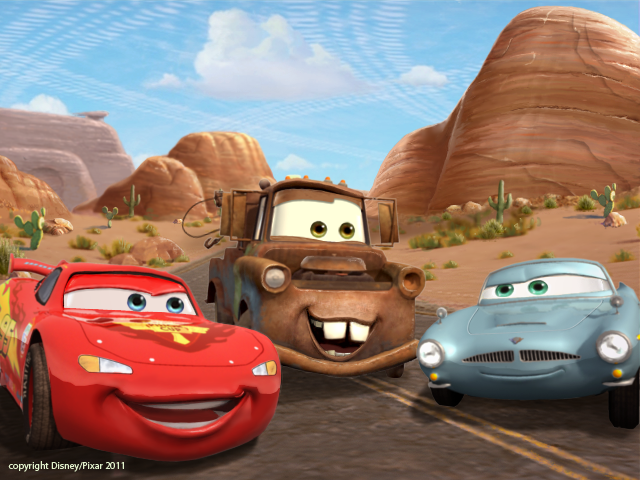 I built and textured three of the characters for the CARS 2 Explorer title; Lightning McQueen, Pacer and Sheriff. Of the three characters I found Sheriff (bottom image) the most difficult to do. It wasn’t that he was more complicated than the others, it was that I had less reference to go by. 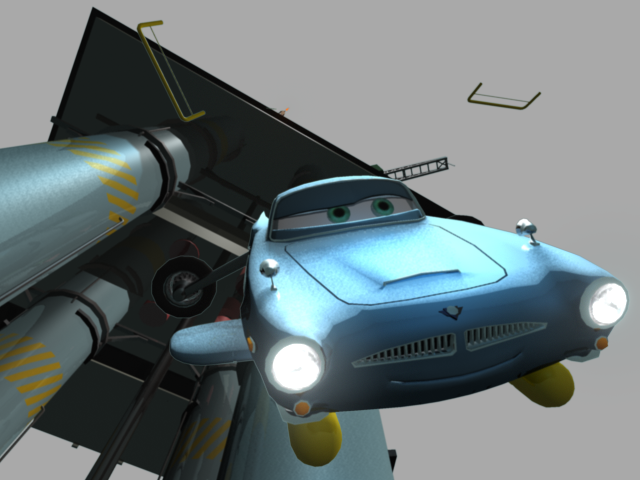 I wound up basing the model on screen grabs from Cars and a toy car I bought of the character. 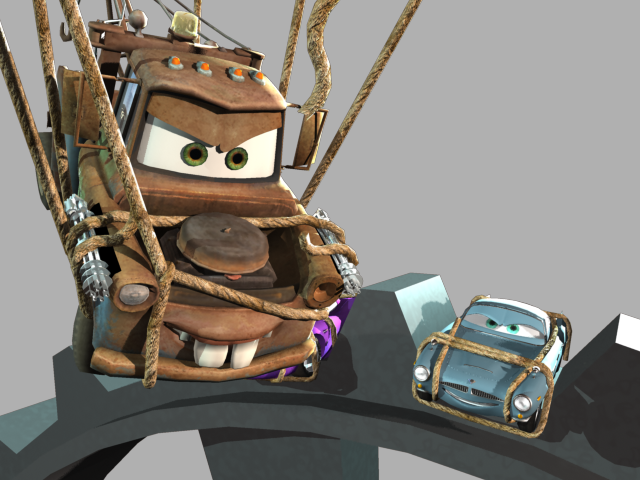 Here is McQueen with Mater and Finn McMissile (below). I composed and lit this shot and did the over-painting in Photoshop. 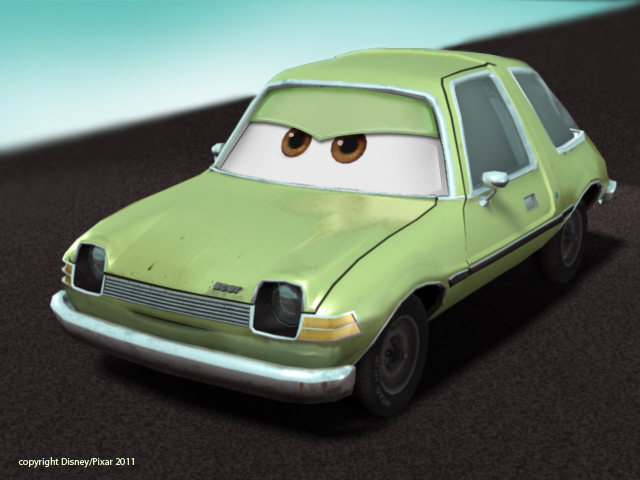 This rendering of the Pacer (below) was never seen in game. 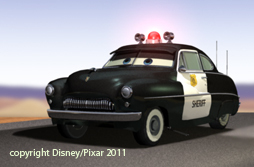 It was part of a group of images sent off to Pixar for approval – which is why the background is so simple. One thing about creating this model was that originally the model said “Pacer” on it. There are three Pacer emblems on the car and you can see the one on the hood here. At one point during the project having the rights to use the name “Pacer” was in dispute, so we were asked to remove the “P”. So the character was called “Acer” instead. I did notice when I saw the film, though, that the “P” had returned. It was a bit of a trip down memory lane modelling this car, as I learned to drive on my mother’s Gremlin (also an AMC car). The sideview mirrors and door handles were identical on those cars. I hadn’t thought about those details in ages. This was one of my favorite scenes to do. When the staff at Leapfrog saw it they thought it came from Pixar, so that was a nice compliment. This is my first ever blog post so I thought I’d put up a few images I did for work last year. I work for Inlight Entertainment in Victoria, BC, Canada as an artist. 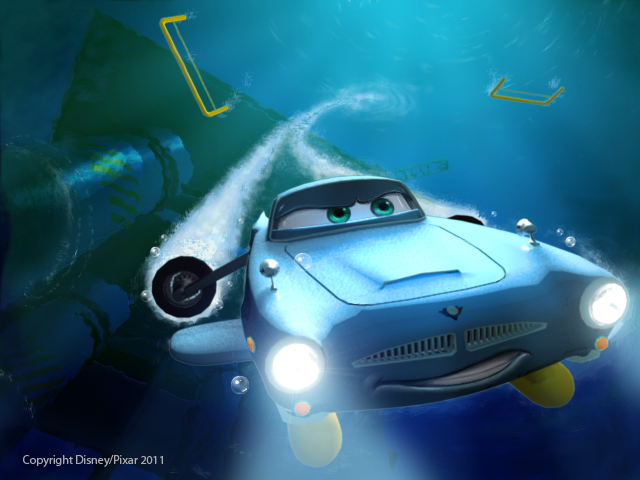 We produced a Cars 2 title for the Leapfrog Explorer. 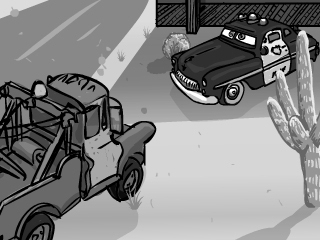 One of the things I liked about doing this project was working on the story panels. I worked with another artist creating models in Maya and rendering the rough scenes out in layers. We certainly didn’t have the budget to rig the characters like Pixar does, so we roughed out the scenes in 3D, then I used Photoshop to paint the final versions. When I saw the film in the Theatre I was pleased to see how close we got this scene. 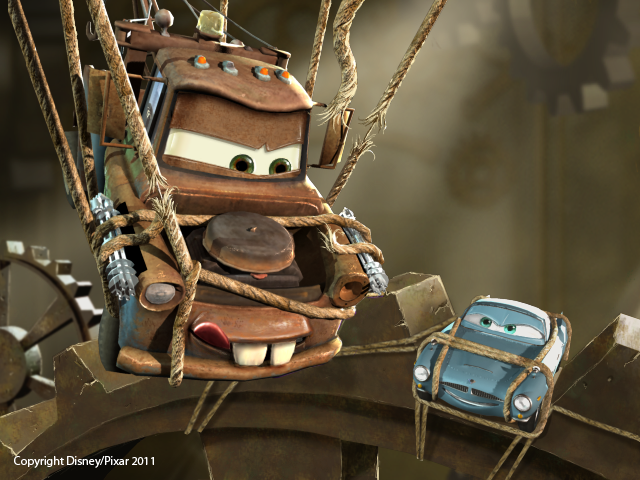 Here Mater and Finn are trapped inside Big Bently (Big Ben). Painting the expressions was definitely the most challenging part of the process. When we do a project like this we get lots of reference images from the film production team, but we were working on the game at the same time the film was still being made, so allot of what we saw was rough or went through a lot of changes.